Finally, at long last, the dryer is vented to the exterior of the house (instead of into the crawlspace). This has been one of the big outstanding issues. It's not so much that it's hard.. it's just intimidating the first time you poke a hole in your new house. I know, some of you veteran house bloggers are rolling your eyes at us and grumbling about why we even bother writing this up.. but to me it's a big deal. Luckily Dad was here to save the day (or at least prod us into just doing it). I'm a little vague on the details.. (I was planting bougainvilla and daisies in the front yard with Mom) but I think I know most of what happened. First Marc and Dad crawled under the house and drilled a hole in the center of where they wanted the vent to emerge. Because all the plumbing for the sink and the washer was in the way in -this- joist bay, they ended up running the exhaust under the first joist and into the next joist bay. They drilled the initial hole and then went around to the outside of the house to cut the vent hole around the pilot hole. 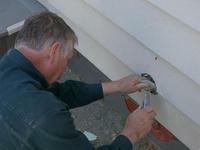 Dad used a utility knife to remove the (aweful hideous) vinyl siding. 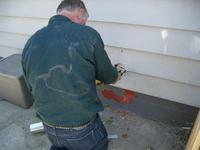 Dad using sawzall to cut out the redwood siding. I think Dad centered the pilot hole in a circle the size of the vent kit.. then he used a utility knife to cut through the vinyl siding. The vinyl siding is installed over redwood siding. Dad drilled more holes in the redwood and used a sawzall to cut out the redwood siding. 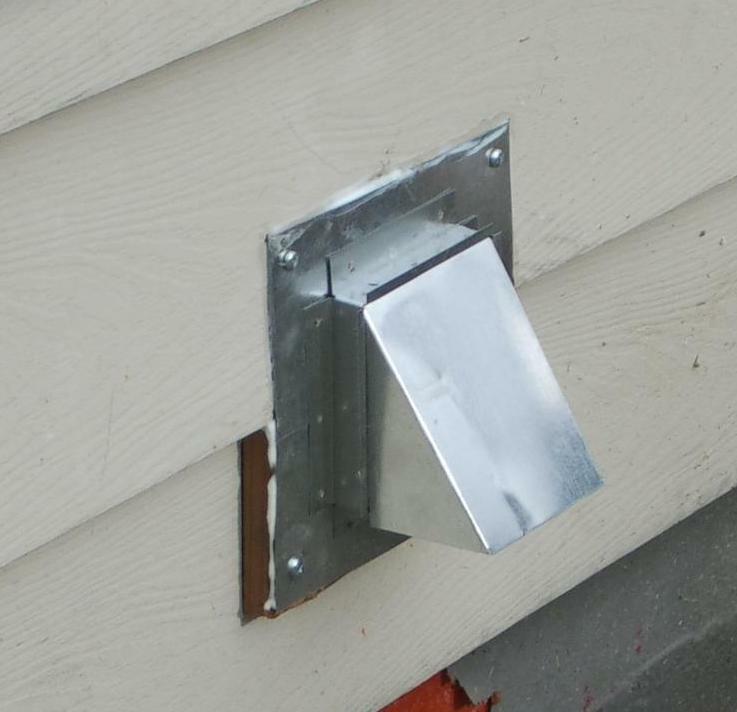 Because the vent came out of the house over a seam in the vinyl siding they also built a .. "shoe" to keep it level with the side of the house (I think you can see that in the first picture in this post). They then caulked the heck out of it.. and ran a load in the dryer. So, yeah! This means I can tick our progress bar for clearing the pest report up to 30%. Yeah progress!